The dogs of Greet Ranch look all directions to protect the hay trailer from any predators, or cattle! Bob, Elsa, Lucas, and Boomer stand guard. Well, actually it is Monday, but we’ve had Wind the past day and unlike other parts of Wyoming, we don’t always get wind here. We manage to whine like wind through the wires when we get it, too! Barring the drafts that blows through this old house and the creaking of the cottonwoods in my front yard and the occasional thunk of a branch falling on the roof…wind never is a big thought til you have to go outside in it. Warm though it was, I still dressed in my usual coveralls and Carhartt coat and scarf and heavy gloves. Yep, sure enough, my overheating quickly was cooled by wind chill! 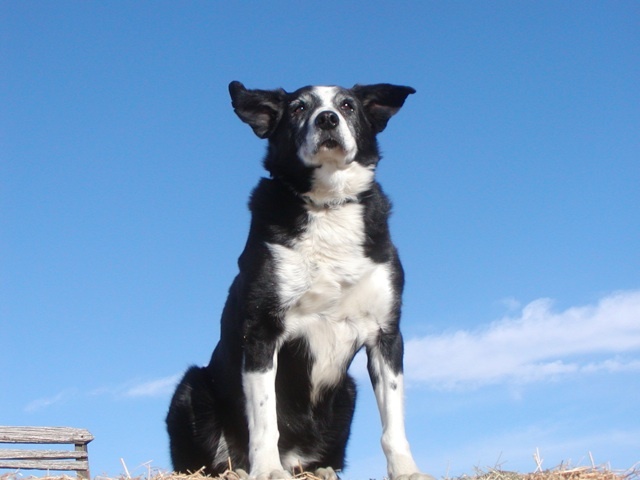 Bob celebrates Windsday with a salute of wind-blown ears! Play becomes work later for puppies as it does humans… so, I’ve always tried to get all my pups to chase… sssshing them up and chasing rags tied to long sticks or kicking balls around. Since this was my first litter of 10 wonderful English Shepherd pups, I had an entire team to play ball! I went out one day to video them, and turned the occasion into what I call “Puppy Soccer”. Fighting my poor old Mac computer, I managed to put together 3 minutes of cheerful “play” of heeling a ball. Unfortunately, I didn’t have enough memory to include some other shots… but you get the idea! Enjoy. When you get that feeling in the morning that perhaps you should drag your camera along… just in case. Do it! The thought crossed my mind this morning, but protecting it from hay and grain dust seemed too much to bother with. Bad decision. A young fox came by not 15 feet away from Vernon…packing half a rabbit and very unconcerned with either Vernon or Boomer. Boomer was too intent on mice hunting to notice him until the last minute, and when he turned and barked at him, the fox dropped his half rabbit and ran off across the frozen creek. I have thought of hauling it on the super cold mornings, just to snap some frosty faced portraits of various members of our crew. I need to work on not being so lazy! I just have to take my smaller camera and deal with the large bulge it will leave in my work coat. We saw the fox the day before as well, crossing the field and circling my house…I sure hope he’s not smelling and/or isn’t too curious about puppy smell as Dally and Doux both get left behind at the house. We often have 4 dogs riding the hay trailer every morning. It can get quite congested! Bob, Johnny’s dog, is the senior member, well versed in riding the trailer and supervising the cows… Then there is Boomer, my black Aussie, the poor OCD dog that will rip into a bale of hay with amazing determination…to do what, I’m not sure! Burying his snout deep in the bale, he’ll rip madly into it, flinging hay bits everywhere, sticking hay up his nose and into his eyes. He sneezes, rubs his nose, and returns to attacking the evil bale. He is a strange dog. Lucas has experience on the trailer as well, finding a spot and laying down to enjoy the ride. He is ever vigilant on where I am, as Vernon and I rotate the driving position in the tractor. I often check in the mirror as I drive, and see Lucas peering between the slats on the hay trailer, making sure I’m still there driving! Elsa is the newbie. She doesn’t relax and, like Lucas, often seeks me through the slats. Everytime I jump off to open a gate, Elsa has to come with me. Even though I tell her to stay…she can’t leave me… and is very sneaky and quiet and shadows my steps to “help” me open each and every gate. She also can’t just feint at the cows and keep them back from the trailer…she insists on jumping off and chasing them… a big No-No. She often takes Lucas with her, and I have two dogs in trouble. I’m trying to figure out how to help them understand they MUST stay on the trailer… Tieing them won’t work, leashes may, if I can do my work and grab the leashes too… I may just tie the dogs to me… hmmmmmm. I’ll think on that. Wish me luck on foxes and shadow dogs….